Thomas Hawk has been documenting how to get your photos viewed over on Flickr. Certain subjects just seem to garner more attention. I find it interesting how some items change over time. Obviously with the changes in technology and the advances in Flickr there will be more that photographers can do online (i.e. geotagging). Read the articles for each year to gain a more indepth understanding of the tips that Thomas Hawk is speaking of and then get on over to Flickr and start having fun. Buyers are looking beyond Getty and Corbis and their sub-divisions for photos that are different and original. We’ve seen that they’re approaching photographers on Flickr, even when those images aren’t being offered for sale, and they’re looking through personal galleries too. Read the rest of the story and find out about Dan’s new business. I can’t verify the accuracy of this, but I have looked at it and you can too. Barack Obama’s Flickr Photostream. It seems like an accurate profile. There are almost 3000 photos. He has over 7000 contacts. He has so many testimonials I didn’t count them. The Library of Congress is Uploading to Flickr! Really! How much can you learn about a person through a self-portrait? What if you saw a different portrait of the same person everyday for a year? How much more do you think you’d learn about a person? Well, I’m going to take the Flickr challenge and take a self-portrait a day for each and every day of this year, 2008. I’ve inserted a place on the left sidebar where the latest portrait will appear. I have to be honest, this is a daunting task. Pick up my camera and photograph myself each and every day for 366 days in 2008. Now anyone should know by now, that in this day and age that if you are going to put anything, and I mean ANYTHING up on the www (that’s WORLD WIDE WEB for those who may have forgotten what those w’s stand for) it’s up for scrutiny by anyone. That means ANYONE who has access to a computer (or perhaps a phone) with Internet access. If you don’t want folks viewing your photos, or your words for that matter, then you really have no business anywhere near a computer. I hate to admit that these things happen but let’s be real folks. 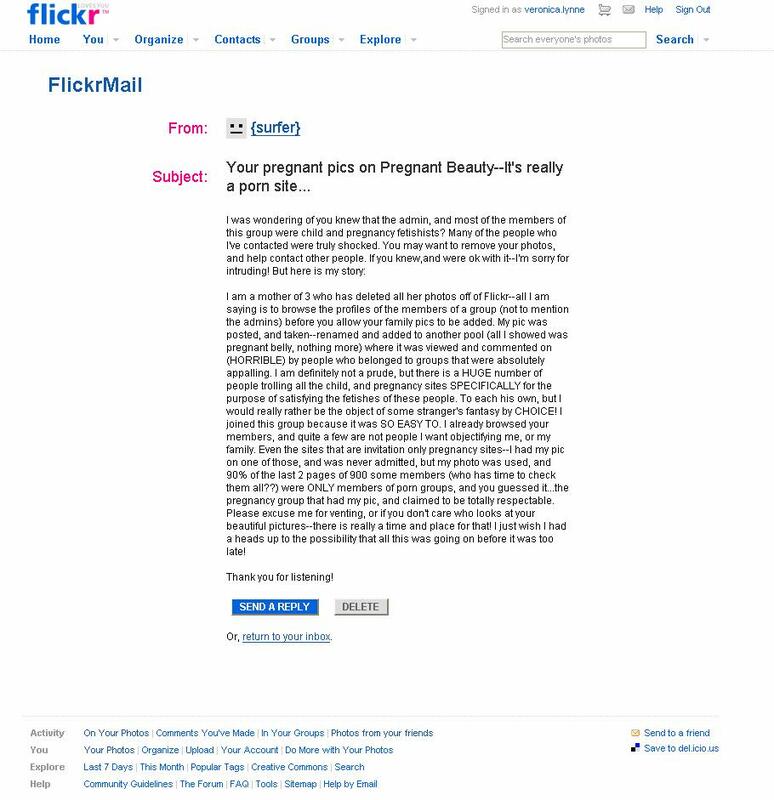 Has anyone else used Flickr and received this email? So other than simply avoiding the Internet how does one go about protecting your work online. There are some simple things that you can try which may or may not circumvent photo theft: watermarking your work, right-click disabling your work, and shrink wrapping your photos. You can read a little more about these here. Digital Photography School (dPS) also offers a few ways to protect your photos. The Online Photographer offers some suggestions too. I would like to post some pictures online, but I don’t want anyone to copy them. How can I protect them from being stolen? Any method designed to stop visitors from downloading images can be circumvented by a person with the right set technical skills. Once you understand and accept the fact that you cannot stop people from copying your images online, you still might want to try and slow them down. This article covers a few different roadblocks you can place between your images and their audience. My suggestion is to find yourself a professional association to join. I am a member of the PPA (Professional Photographers of America). This group is wonderful for photographers. They offer all kinds of free advice and benefits to members including copyright assistance, legal resources, insurance, malpractice protection and a host of others. It’s well worth the price.